Indietracks - an indiepop festival: Vote for us in the UK Festival Awards! 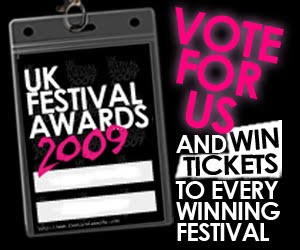 Vote for us in the UK Festival Awards! Indietracks has been nominated in five categories in the 2009 UK Festival Awards, including two special critics’ choice nominations for La Casa Azul's and MJ Hibbett's fantastic performances - hurray! If you enjoyed Indietracks and fancy helping us out, it would be great if you could cast us a vote or two. If enough of you vote, we may have a fair chance of coming away with Best Small Festival, Best Family Festival or the Grassroots Festival award. And it would be even more wonderful if MJ Hibbett or La Casa Azul picked up awards! Voting for Indietracks will really help to raise the profile of the Midland Railway charity, who host the festival every year and work tirelessly (and on a voluntary basis) to make sure everything runs smoothly. And boosting the profile of Indietracks will also help us out when we're asking some of the bigger indiepop names to play next year. It only takes 20 seconds to vote, and you can also win a pair of VIP tickets to every winning festival next year. If you’d like to vote, please visit the Indietracks nomination page before 14 October. If you are having difficulty using the website, you can also visit www.festivalawards.com and vote there. You'll need to visit the drop-down menus on Best Small Festival, Grassroots Festival, Best Toilets, the Virtual Festivals Critics' Choice Award and Best Family Festival drop-down menus to vote for us. The final shortlists will then be revealed and people can vote again for the final winners. Thank you!